Greetings, everyone! 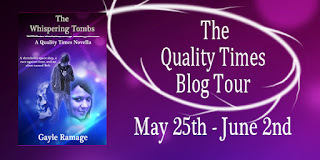 Welcome to today's guest blog post from author Gayle Ramage. 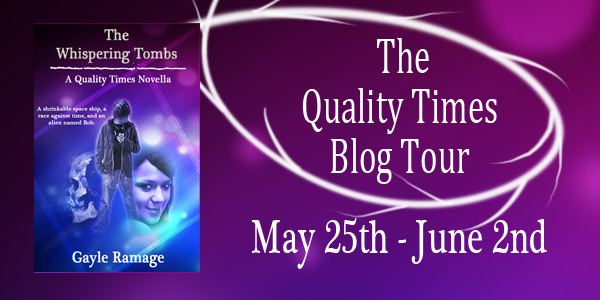 Gayle is here today to answer a few questions, and to tell us all about her brand new book (part of the Quality Times blog tour). Gayle Ramage is a writer, living in the Scottish lowlands. She would love to grow her own TARDIS if only to go back in time to find out if her ancestors were as mad as she is. So, sit back and enjoy, as we find out a little more about Gayle and her new book! TMH: Why don’t you start with telling us a little about yourself? What genre do you write in and why? GR: I’m a Science Fiction and fantasy writer, and write in those genres because it’s great to immerse myself in something totally different from mundane real life. TMH: Were you an avid reader as a child? What types of books did you enjoy reading? Do you still enjoy those, or something different? GR: Yes, I loved to read as a child, especially Roald Dahl’s whimsical books. I also remember reading a series by Hunter Davies, I think, about a young boy who, when he put on his grandfather’s WWII bomber jacket, became a teenager. Sadly these books are out of print, now. So I suppose I’ve always enjoyed reading fantasy stories. TMH: Tell us about your latest book. What inspired you to write it? GR: The Quality Times series is partly inspired by Doctor Who (people travelling through space and time), but it was also inspired by wanting to write my own light science fiction series. TMH: How long does it take for you to write a book? GR: So far I’ve only written short books. Quality Times is the longest one I’ve written, clocking in at around 16000 words. So, for instance, a first draft can perhaps take me a week or two, depending on whether I have the entire plot sorted out in my head. TMH: What’s your favorite part of writing/publishing? What part do you dislike? GR: I think my favourite part is writing the first draft. With first drafts, you have a freedom you don’t have with other drafts. The most important thing at that stage is just to get the story written down, and not to worry about spelling and grammar. That comes later. The part I dislike most about writing is marketing. Seriously, there’s always that danger of coming across as a spammer. That’s why I only promote my books on Twitter, and even then it’s maybe once a day and that’s it. TMH: What do you see for the future of publishing and e-books? GR: I’m afraid I don’t have a crystal ball when it comes to that. The whole self-publishing movement is evolving all the time. I know there’s a lot of dreich (that’s ‘rubbish’ in Scots, folks!) out there but on the other hand there’s a lot of great self-published writers. They just need to be given a chance and not tarred with the same brush as the ‘writers’ who are only in it to make a quick buck. I just see ebooks as an alternative format to print books, like audiobooks are. TMH: What is the most difficult part of being a writer and do you write whenever the mood strikes, or do you have a specific routine? GR: Oh, I wish I had a routine! No, the mood (or rather, the muse) seems to strike when I’m trying to get to sleep, or when I’m doing some housework. I think the most difficult part of being a writer, in my personal experience, is thinking people just assume I’m messing around on the internet when I’m sitting at my netbook, and not realising I’m actually working, when I’m writing my stories. Thankfully, my other half is very understanding and encouraging about my writing, but I know other writers whose partners aren’t as enthusiastic, sadly. TMH: Do you have another book in the works? Would you like to tell readers about your current or future projects? GR: Yes, you could say I have quite a few books in the works. I did start a time-travelling assassins series last year (I published a couple of short story prequels to the series) but I’ve lost my passion, a little, for it, and I firmly believe that if you don’t love the story you’re writing, then put it aside. 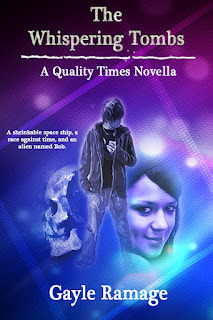 I’m still going to write Book 1 in the series, as I have had a number of people say they want to read it, but for the moment I’m going to concentrate on another Quality Times novella, and then either return to Book 1, or continue with my historical-fantasy ‘A Dark Age’, whose first draft is done and dusted. TMH: If you could team up with any other writer out there and write a joint novel, who would it be and why? GR: At the moment, it would have to be Derek Landy, creator of the Skulduggery Pleasant series (about a Skeleton detective and his teenage sidekick). He just mixes the humour and drama so well, and his books were partly the inspiration for my time-travelling assassins series. TMH: What do you know now that you wished you knew when you started in the writing business? GR: To get all the preparation for your book(s) ready BEFORE the publish date, hence why I’m doing this blog tour! TMH: What’s your comfort food? GR: Hmm, I wouldn’t say it’s ‘comfort food’ but I like a nice chicken stir fry, now and again. TMH: What’s a quote you like the most? GR: Currently, it’s one that appears in a Doctor Who novel, called Vampire Science, featuring the Eighth Doctor. What kind of person actually sits down and decides that no one should be allowed to end a sentence with a preposition? Not even decide what ideas you should or shouldn't talk about, but to actually make rules about what order to put your words in... It's such an amazing kind of petty tyranny. TMH: What’s your dream vacation (assuming money and schedule were no issue)? GR: Ha, well, given that I’ve never been on an actual holiday (in the UK, or abroad) in my life, anywhere! For years, I did fancy going to San Francisco, after reading the Tales of the City series by Armistead Maupin but, I dunno, I’d just like to go anywhere! TMH: Is there anything you wish you could go back and change from your past? GR: Yes. To have started doing Open University courses a lot earlier instead of waiting until 2010 to do my first one. But then again, if I’d taken the course earlier, I wouldn’t have met some great writer friends! TMH: Thanks, Gayle, for the interview. And now, let's take a look at Gayle's new book, The Whispering Tombs. In The Whispering Tombs, Quality and Tim are residing at the luxurious Baala Haven Resort, on an unpronounceable planet, when they're invited on a quest to find ancient hidden treasure by a wealthy alien archaeologist. Reaching the caves of Azrokaran, however, loyalties are tested to the very limits as those within the group reveal their true colours. And there you have it, folks. Be sure to ask any other questions you'd like to know more about in the comments section. And be sure to check out more about Gayle over on her website and blog, or follow her on Twitter. If you'd like to check out her new book, click the cover above (or for the UK version of Amazon, click here). Great interview!! There's that Dr. Who dude again...I really should get to know him better. Angie - Thanks very much! Hope you enjoy!